This is a 2001 Menghai ripe cake. I had purchased this cake from Amoy Tea (see previous blog). The proprietor had told me that this 2001 Menghai was sold by them to a regular tea collector customer in 2001/2002. This tea collector had kept this tea and have now recently sold back the tea to the shop. I have never owned any Menghai earlier than 2003 for 2 main reasons; the higher costs associated with old teas and that I am no expert in telling apart the real old Menghai from a fake, which I believe is on the rise due to the high tea prices. Its no surprise that I have broken up this cake for my drinking pleasure. I noticed that there was no manufacturing date on the wrapper. In addition, the smaller label encased within the case was 'too entrenched' that it broke to tiny pieces when I tried to extricate this label. The compression of this tea cake was quite high and it took quite some time to break up the cake. This Menghai 2001 ripe cake has a distinct aged raw pu erh tea aroma. I could not exactly pinpoint or fully describe the taste; it seem to have cereal and a chinese herbal aroma as well as a hint of a cooked rice flavour. It also has a mild scent something like an old leather bound book which I actually enjoyed. I found this tea to be an extremely smooth and pleasant drink. I used a shade less tea leaves for brewing as it was very strong during the 1st 3 infusions. Can easily make 10 good brews. I can tell that the previous owner of this tea kept and stored the tea well as there was no foreign smells and scents (like smoke, cooking smells, detergent). How does this tea compare to my current stash of ripe pu erh (cakes on average 2-5 years old)? It is obvious that every ripe cake will have its own taste characteristics and even those cakes will the same recipe but different production years will taste different as well. This 2001 Menghai cake has that unique aged raw aroma. The other 2000 ripe brick I opened (and finished -13 Nov 09 blog) has a red dates (the fruit) aroma with a sweetish sensation. 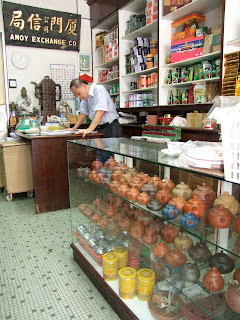 I will be going to Penang soon to visit a tea friend and pick up an old Menghai cake which I had purchased. I look forward to its unique aroma and taste. As I write this blog, the YOG (Youth Olympics Games) held in Singapore will be ending this week. I enjoyed watching the many sports events and I am sure many of these athletes will be stars in the future.... like good pu erh tea. This teashop is in Singapore. 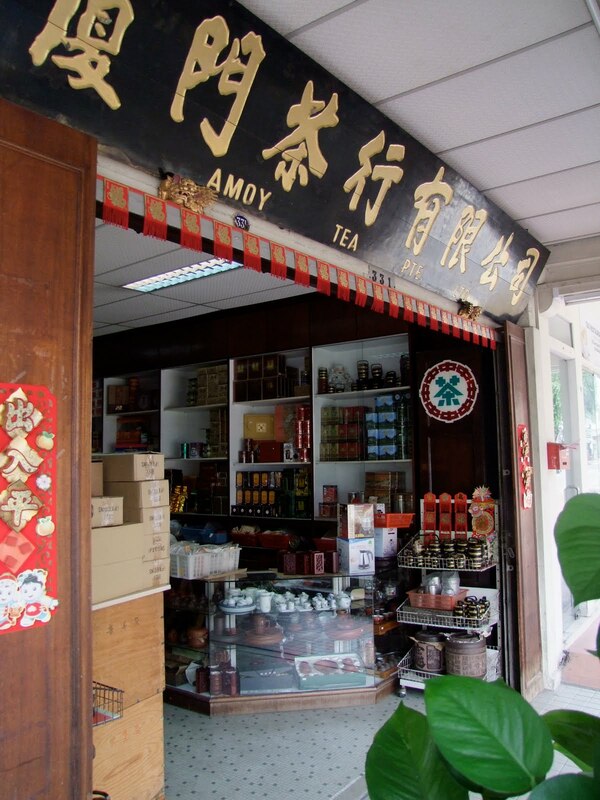 Amoy Tea Pte Ltd is located at 331 Joo Chiat Road. This 'treasure find' of a teashop which I would describe as 'frozen in time' is must visit tea shop for Chinese tea drinkers when you are in Singapore. When Singapore is described to the world, people especially the locals would know the rapid modernization of Singapore over a short span of 40+ years. Today, Singapore boast of a world class financial centre and considered one of the most globalised nation of the world. 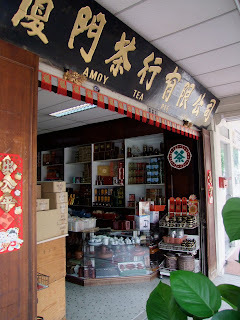 Yet Amoy Tea appeared that it had not change its facade much for 30-40+ years. It is located in a 1960s' pre war shop house in east coast of Singapore. You will see many new modern eateries where you can eat in air conditioned comfort and choose from a myraid of cooking styles from vietnamese, western and different Chinese culture and dialect traditional cooking. Yet you will observe from the pix that Amoy tea had maintained that 70's aura within the premises. Amoy Tea is run by the Tans, a uncle and nephew enterprise. Selling only traditional Chinese tea, you can get to buy a bag of liu bao, tgy, a tin of white tea, oolongs, loong ching, pu erh and many other teas. They do sell tea accessories like teapots and gaiwans. I would like to highlight that this shop only takes cash payment. There is also no tea sampling of their teas as the nephew, Mr Tan Yen Kwang explained there are manpower and space constraints, that Amoy Tea is unable to offer tea sampling. You do get to drink a cup of their house tea when you are in their shop. I bought a couple of ripe pu erh tea when I was there. See my next blog. For those who intend to visit the shop (close on Sundays), it is near the junction of east coast road, between Marshall Lane and Koon Seng Road. Don't forget to try the world famous laksa (coconut curried noodles) when you are in that vicinity. RELOCATION NOTICE - Amoy Tea has relocated. They are now at Block 45 Sims Drive #01-164. My 3 kg box of tea arrived from China a couple of days ago. I had ordered some ripe tea from Yunnan Sourcing over the weekend and the box arrived at my door 5 days later. This order comprised of all ripe pu erh. You will have observed that there are 3 identical 2007 Fuhai ripe cakes (see 2nd May blog) in this order. I am extremely impressed with this cake and this this my 2nd reorder of this cake. The rest of the cakes are (middle from left) 07 Feng Qing, 08 Yong Pin Hao, (lowest row from left) 06 Haiwan, 07 Haiwan 7588 and a 08 Fuhai ripe. I had the box air freighted by ems which took up a fair bit of the expenses. It is interesting that the 07 Haiwan 7588 is a 250g brick and its length is almost as wide as a regular size pu erh cake (see last pix, click to enlarge). I would think the compression of this brick is fairly light and the tea can be broken up by hand. Yunnan Sourcing is operated by the proprietor Scott Wilson. He is an American and operates his tea business from Kunming, China. He is fluent in spoken mandarin. I met him last year in Kunming and was extremely impressed with his Chinese as he sounded like a local there. will seem like a candy store to tea drinkers and collectors. I find his prices of tea reasonable. He purchases his tea from authorized tea dealers so you can be assured of no fakes. I find his service to be good and his emails prompt and courteous. His packing is good as evidenced by the above pix. In addition, Scott will try to locate those tea a customer may wish to buy thats not on his site. I would not hesitate to recommend Yunnan Sourcing as a reliable source for your tea needs. I hope to visit him again when I make another trip to Kunming.......hopefully soon. This is a 2006 Mengku ripe cake. The beautiful wrapper of the cake indicates that this cake recipe won a gold award from a chinese tea expo. The wrapper describes the cake as a 'gongting' ripe cake. When a ripe pu erh tea fermentation process is complete, the tea leaves are sorted according to their size. Sorting of the tea leaves is done using a blower and by hand. Leaves that are blown the furthest are usually the smallest and is a custom to accord these leaves the highest grade or gongting. These leaves are usually the smallest leaves. These leaves are further sorted by hand and tea stems and broken leaves are usually removed leaving the whole leaves or buds. Good quality gongting tea are usually very expensive as the taste of a gongting tea have a reputed creamy and sweet taste. This Mengku cake incorporates gongting tea leaves into the cake composition. When I made a brew( I recommend a stronger brew) of this tea, I am pleased with the Mengku aroma which is a very pleasant, intense wood and 'fresh herb' scent. The taste has a nice sweet finish with a hint of cream and nuts. Can make 8-10 infusions of good tea from one brew. But I digress - I have a friend who recently started to enjoy drinking chinese tea esp ripe pu erh. He followed me by brewing his pu using a teapot (about 160ml with 7/8 gms of tea). He had some difficulty achieving his preferred brew. We solved the problem together and our findings are that when you pour out your tea into a pitcher or teacups, the initial start pour is diluted compared to the end pour which is a stronger brew (applies to gaiwan as well). A tea drinker's preferred brew strength is also dependent on the teapot size, amount of leaves, speed of pouring out the tea and the time the water stays in the pot. As I have mentioned many times, there is no right or wrong as long you are happy with your tea. My tea friend used the brewed tea color as a guide and his start pour as his gauge (it did not help when he had used dark colored teacups) not knowing the tea would be darker when the pour was complete. He tried to adjust the amount of tea leaves and the timing of the water instead and achieved mixed results. I would like to stress that my tea brewing method may not be right or suitable for you. Do let me know your brewing technique and share with me (video would be nice). Back to this cake. This is a very delicious 400g ripe cake. I appreciate the larger size (normal size 357g), as it allows me to make a few brews to determine my preferred brew strength of this tea and still have lots of tea left to enjoy this inexpensive pu erh (its about us$18 when I checked last month).